Carole (Catherine Deneuve) is a naturally beautiful Belgian girl living with her sister Helene (Yvette Furnaux) in mod era London. When she was walks down the street, men’s gaze instantly shift in her direction. They desire her, they want to possess her, but she is repulsed by the thought of any man touching her. She is cold, distant and aloof, and being a foreigner in a foreign land, she has distanced herself from the general public. Is she shy, or has vanity created the icy persona that she exudes? At first, she is a mystery, not only to the people she meets, but to the viewer of the film. This is exactly the mood that Roman Polanski creates in his quintessential film about the downward spiral of a woman whose repressed emotions will lead her to homicidal action. 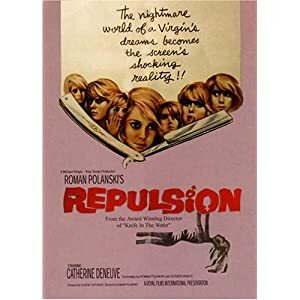 Repulsion is not just a horror film; it’s a psychological study that delves into the psychosis of one woman’s spiraling descent into homicidal madness. For the first hour the film moves at what could be best described as a snail’s pace. To be honest, I was getting ready to dismiss it, and stop the film. But I decided to keep going with it, and my instinct was rewarded tenfold. Looking back now after finishing the film, I can understand why Polanski made the tempo of the first hour move at that pace. The slow, meandering nature of the story sets in the viewer’s mind, a sense of safety. A quiet and reserved feeling of normalcy, all the while building up to the tension packed hysteria that will ensue once Carole is left alone. In the first hour Carole is protected, surrounded by her sister and her colleagues at work. But in this sterile world, Carole is a cipher, non-existent to those around her, moving from moment to moment. She has no motivation, no depth; her life is in the hands of the self-absorbed people surrounding her. They dominate her, unknowing of the deep rooted problems that are bubbling below the surface of her solemn personality. When Helene departs for Italy on holiday with her married boyfriend, Carole’s guarded existence is left in shambles. Without Helene’s domineering personality, Carole is left to blow in the wind with the imaginary demons that are haunting her. The safe haven of the apartment becomes a vortex of sounds, shadows and images that will slowly cast Carole into the abyss of madness. Gaping cracks create large separations in the walls, voices and shadows appear just outside her bedroom door, disembodied arms protrude from the hallway walls as she walks along, groping, fondling and assaulting her. But most frightening, is the specter of Carole’s true psychological horror, a man who appears in her bed each night and rapes her. Through the use of ingenious camera angles and close ups, along with snippets of progressive, experimental jazz music, Polanski creates a claustrophobic prison cell of the apartment. Time is told through the decaying carcass of an uncooked rabbit which Carole has removed from the refrigerator. It is the first sign that Carole has lost touch with reality, as the soon putrid animal has no effect on her whatsoever. When a male acquaintance that has been pursuing her stops by to check on her well-being, the self created barricade that the apartment has become for Carole has been violated. Suddenly and without any inkling of hostility, she lunges at her perceived intruder and bludgeons him with a candlestick holder. She deposits him into the completely filled bathtub in the bathroom, thus removing her one last haven in the apartment. Throughout the early moments of the film, Carole uses the bathtub to cleanse herself of the unsatisfactory interactions she has had with people on the outside of her safe domestic life. Now, with the body stored in this last redoubt, the drain in her mental tub is let out complete, and she herself becomes a specter. One more intruder will meet his demise in the apartment, before Helene returns from her holiday, to the horror that awaits her arrival. This brief synopsis that I have written does not do justice the intricacy and technical expertise used by Polanski to convey this story. At times I was reminded of Hitchcock, along with smatterings of Val Lewton. One of the most striking visual images was that of the sprouting and shriveling potatoes on the plate in the kitchen. As Carole’s mind slips further and further into insanity, the threads of the sprouts become longer and ganglier, while the shriveling skin best describes the decay taking place in her psyche. By the last time we see this plate of potatoes, it looks like a Dali surrealistic painting. All throughout the film, we are given very little insight into the events that have transpired in Carole’s life that could have brought about her collapse. Most reviewers I have read, just view Carole as a sexually repressed time bomb. But upon just one viewing, and I could be proved off the mark with a subsequent viewing, I think these people are reading the film the wrong way. Carole is not sexually repressed; she has been sexually traumatized in her pre-adolescent life. Early in the film, Polanski pans the camera around the apartment, showcasing the various knick knacks and baubles that abound in the atypical single female dwelling. The camera soon comes to a stop on a framed photograph of Carole and Helene’s family in Belgium. The photo is taken in a side yard with the entire family reclining in a pastoral setting. The looks on their faces is serene and tranquil, except for Carole, who seems to be staring off to her left, in a dazed almost vacant gaze. At the end of the film, after the traumatic events have taken place in the apartment, Polanski once again pans the camera around the dwelling. This time, the docile atmosphere has been replaced with the chaotic expression of violent turmoil as most of the furniture has been upended. He slowly moves across this disheveled landscape and finally comes to a stop on the same family photograph. But whereas before we view the entire family, this time the shadows of the apartment reveal only Carole and her father. With the rest of the family hidden by the shadow, that vacant gaze I mentioned has now revealed a more sinister look of anger in the direction of her father. I could be wrong, and Polanski has always said that he leaves it up to the interpretation of the viewer, as to what transpired in Carole’s life that sent down her path to insanity. But I believe that she was sexually abused as a child by her father. I've never seen this one. It does sound interesting. Coincidentally, DVDTimes (now DigitalFix) posted a review of a new UK release today. It seems there is no real need to go for the expensive Criterion release. It has found its way into my top ten of all time. I think it really boils down to which extras you would rather have. That Clive James interview sounds interesting, but the Criterion has two extras, one of which is a French television interview from 1964 made while filming was in progress and which features shots of Polanski actually making the film. I found that featurette extremely interesting. The other featurette is interesting for the fact that we get an insight from the producer as well as Polanski and cinematographer Gil Taylor. ...one of which is a French television interview from 1964 made while filming was in progress and which features shots of Polanski actually making the film. I found that featurette extremely interesting. Yeah, that piqued my interest too while looking at the Criterion specs. But to pay about twice as much to get it? Both releases have the Polanski/Deneuve commentary. Did you listen to that? No, I had to return it to the library, but when I get it again, it's the first thing I plan to do. Wow, it's been two days since I watched this film, and I'm still thinking about it from time to time. That is the mark of a truly great film. I was just discussing with a guy at work about how there are no really, properly scary movies around now and I was trying to tell him about some classics. I've never seen this though, so it's getting wish-listed. This movie has you written all over it Jon. Like I mentioned a little earlier, I'm still thinking about two days later. It's that powerful. I've never seen this though, so it's getting wish-listed. Have you gotten this yet? Not yet. Too pricey for the decent editions, be it Criterion or one of the UK releases.